So.. that title is kind of a mouthful. Oh well. Pizza is my all around, all time favorite food. If you’ve talked to me more than once, you might already know that. I love finding a fellow pizza enthusiast who can share some tips – favorite restaurants or styles, or gush over how amazing pizza is, just because I love it so much. When I cook pizza, I really appreciate that it can be put together ahead of time, is relatively inexpensive, can be customized based on dietary needs, and will pretty much please whoever you’re eating with. Sometime soon I’ll share my grandma’s famous pizza dough recipe – for this pizza I used a Trader Joe’s pizza dough. I like to keep them on hand in the freezer for the days I’m feeling kinda lazy about cooking. 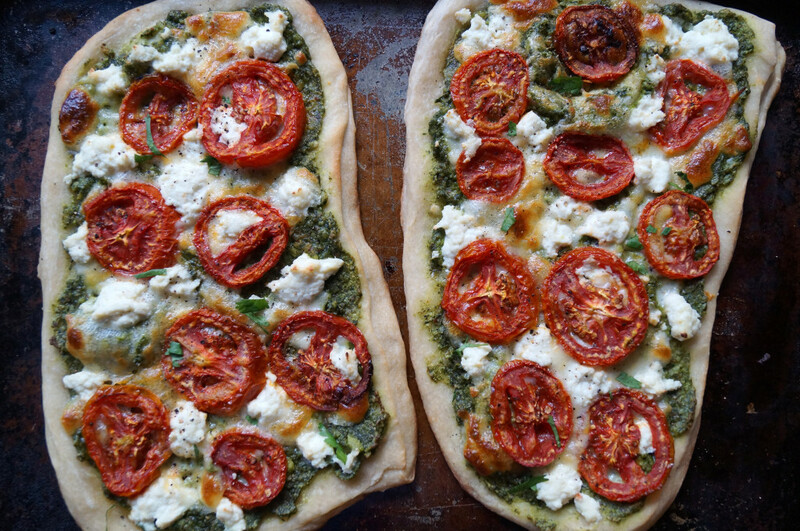 The pesto, tomatoes, & ricotta cheese are really simple to make and take hardly any prep time. Trust me, once you make your own you probably will never buy the store bought stuff again. 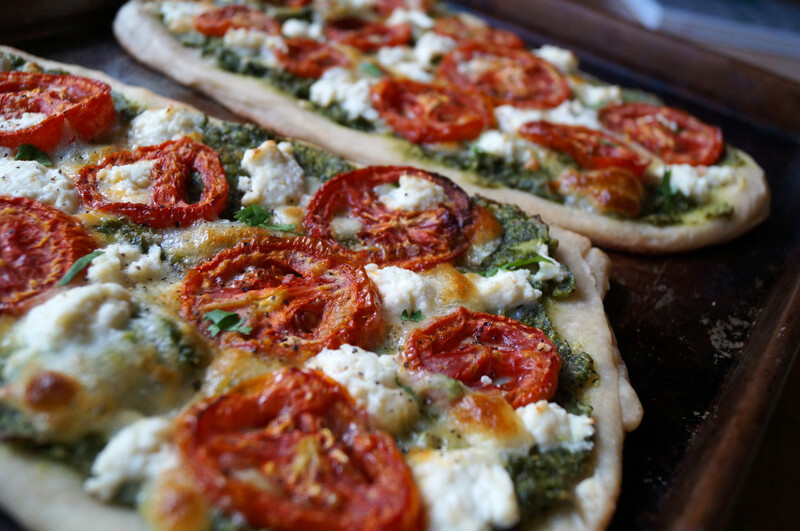 You can use the pesto, tomatoes, and ricotta for a million different dishes – Here I use them to make my most favorite thing. This is a really versatile recipe. I’ve used it on pizza, or to spread on a sandwich to lighten and brighten the flavors, or as a marinade on grilled chicken breasts. Really there are just a ton of options. 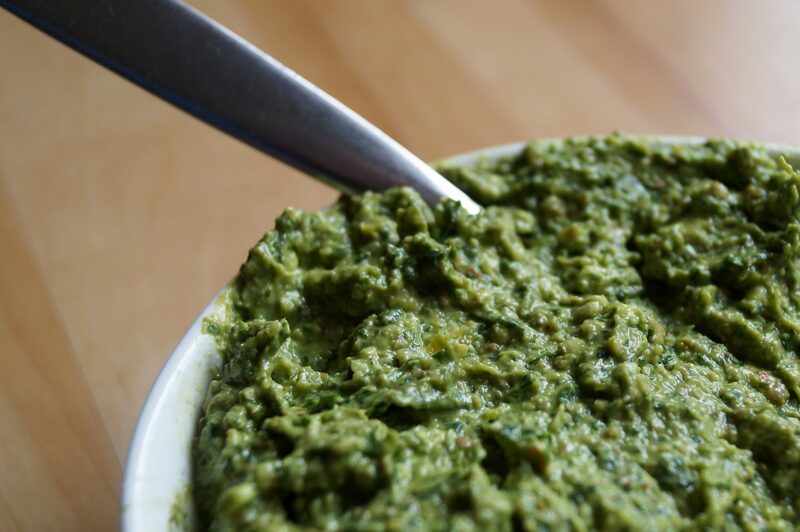 I like to sub out 1/2 avocado with a tablespoon of water for some of the oil that typically is used in pesto recipes. 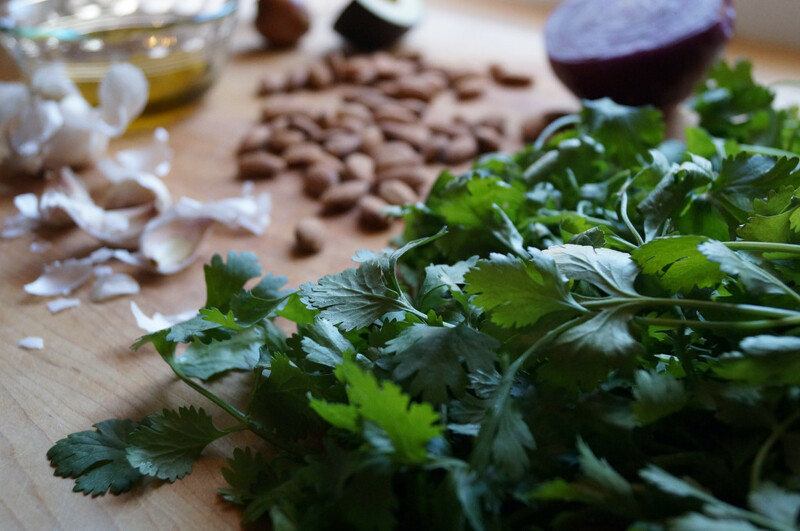 It takes away the grease factor that can totally ruin pesto for me, while still adding to the creamy and smooth texture and bringing out the flavors of the cilantro and garlic. You can get creative with this, too — if you like heat, add a little sriracha. If you love garlic like I do, add an extra clove or two. First, blanch the garlic – this is a must (Add peeled garlic to boiling water for about a minute. Remove and dip in ice water to stop the cooking process). You can definitely blanch the almonds, too, but I never do, mainly because I’m always looking for ways to save a a few seconds. Add all ingredients to your blender or food processor, starting with just 2 T olive oil and adding more if needed. Pulse until smooth. I usually store leftovers in an airtight container & freeze. Preheat oven to 250. Lay tomato slices on a foil lined cookie sheet. 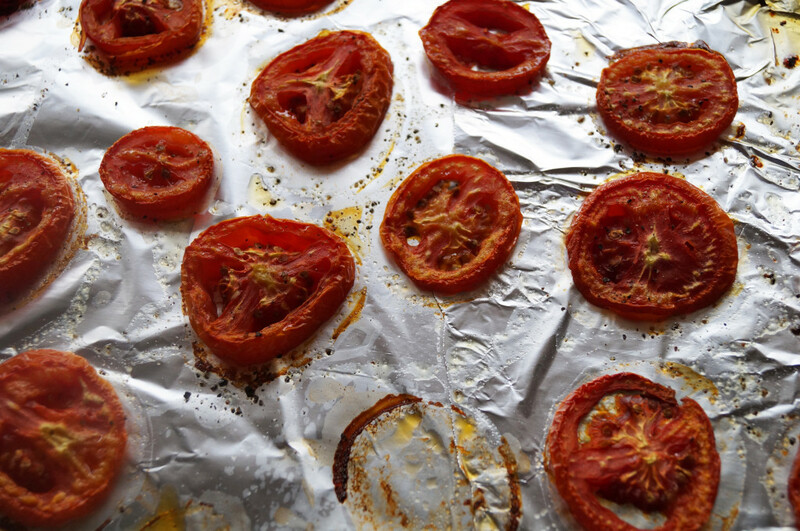 Drizzle with EVOO, then season lightly with salt and pepper. Bake for about 2 hours or until they are soft and sweet. There’s one missing in the photo because I just had to make sure they were perfect! 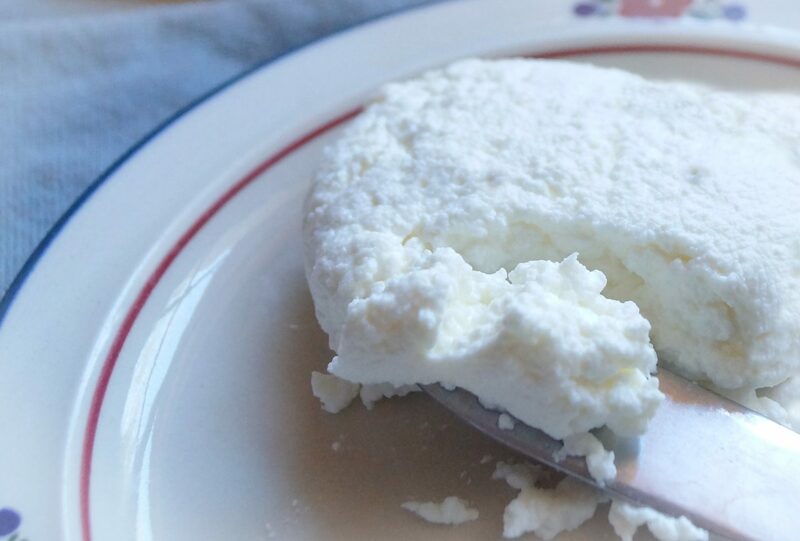 Fresh ricotta cheese has a very different texture and taste to it than the store bought stuff. It’s smooth and soft, and you can just vaguely taste the bite of the delicate lemon flavor. You will use a relatively large amount of milk for the cheese you end up with, but I think it’s SO worth it, and it’s definitely still cheaper than the packaged kind. You can do a lot with it (just google “ricotta recipes”). I like to drizzle it with honey and eat it on crackers as a snack – it’s that yummy! Add milk and salt to a medium thick bottomed pan and gently bring to a boil. Stir occasionally until it begins to boil, then turn off the heat and add lemon juice. Stir a few times and allow it to fully curdle – it takes about a minute. Lay the cheese cloth in a fine strainer over a bowl. Pour the mixture over the cheese cloth and let it drain for a few minutes. The longer you let it drain, the drier it will be. I like mine moister, so I just let it drain for about ten minutes. Preheat oven to 500. Let the dough warm to room temperature. Cut in half and stretch each gently over a greased non-stick cookie sheet. I like to pre-bake my doughs a little bit when I use toppings that I don’t want to be destroyed by the high heat. Spread a thin layer of pesto on the pizza dough and bake for about 5 minutes. Remove it from the oven, then spoon ricotta cheese and lay tomatoes on each pizza. Return to the oven for about another 8 minutes or until the crust is lightly browned and crispy and the cheese is starting to bubble. Season with a little black pepper if you like it and enjoy!